The BioTrac measuring technology is based on simple impedance detection using a 2-electrode system. The BioTrac 4250 is user friendly and is ideally suited to the challenges posed by long-term use. The individual measurement positions can be used independently whenever samples are available to be tested. 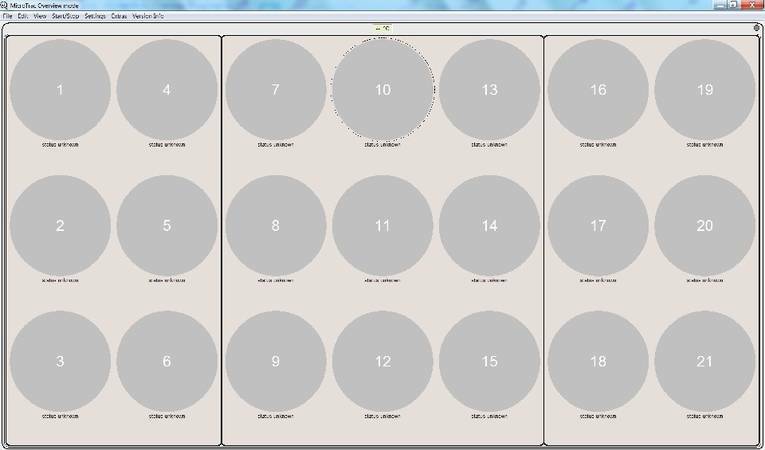 Newly inserted samples will be recognized and analysed automatically according to the parameters set by the user. The entire measuring cycle is automatic and the results are permanently recorded to a central database. Barcode readers and a central LIMS can be connected. The BacWin operation and evaluatoin software is easy to understand and operate. The BioTrac techology is an internationaly highly accepted and proven technology. It is successfully in operation in food and food ingredients, water, as well as pharamceutical- and cosmetics industries. It also plays a leading role in the official food hygiene monitoring in various countries. With BioTrac many microbiological routine applications will be coverd. It can be used for sterility testing, TAMC enumeration as well as testing for index and indicator microbes and to detect microbial pathogens. The scope of applications is limited to those protocols operating on a 2 electrode impedance technology. Microorganisms are detected in real time via the decrease of the impedance in an AC field. Any impedance change caused by the microbial metabolism is detected. In the BioTrac devices a proprietary impedance technology is employed. Usind this technology a standard impedance signal ( Media Impedance = M- value) is registered as the reuslt of microbial growth. During the growth of microbes low- or non charged nutrient molecules are metabolised. This break down of nutrients generates small and highly charged metabolites. The later will result in a change of the impedance of the nutrient media that is registered by the instrument. The more microbes are present in the sample the sooner results will be available. Comprises MicroTrac and MicroAssist measuring and data evaluation software for Windows XPP, WIN-7 and WIN-8. Traditional Windows menu functionality easy to understand and operate without extensive training. Time already expired from start of the measurement is displayed in the form of a pie chart for every position. As soon as the developing growth signal will reach the threshold, detection time will be recorded. If the color code alert mode has been activated the chart will turn the color to red or yellow depending on the limits defined for the individual position. Negative samples or those with results within specification will be marked green. What are the differences between BioTrac and BacTrac? The BioTrac 4250 is appropriate for smaller laboratories and measures only the M-value. This incubator provides 21 measuring positions suitable for disposable cells only. 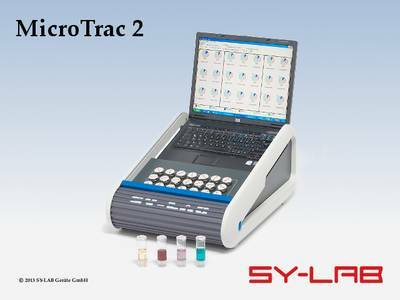 The BioTrac is designed to operate with a laptop as a single incubator. The BacTrac 4300 Microbiological Analyser uses the unique impedance-splitting technology and measures the M-value (media impedance) and E-value (electrode impedance) giving a big variety of possible analyses. Each device contains two individually thermostated incubators for 32 samples each, which can accommodate either disposable or reusable measuring cells. Up to 12 units (768 wells, 24 incubators) can be controlled by one PC. Are there standards for impedance technology? Yes, there are standards for impedance in Austria, C.I.S., France, Germany and the U.K. Does impedance technology comply with the Pharm. Eur.? After a product-specific validation impedance technology complies with the Pharm. Eur. How is measurement data saved by the BioTrac? All data generated by the BioTrac is saved to a database on the hard disk of the PC at the moment the measurement takes place. From this database all measurements can be recalled with the MicroAssist Software anytime. Additionally results can be printed in colour and exported to other programs like MS Excel. Is it possible to obtain germ counts with the BioTrac? Yes. 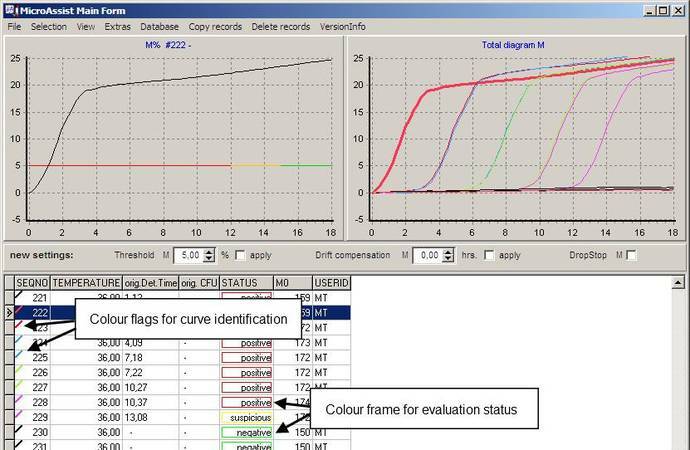 The germ counts are calculated automatically from the detection times of the impedance curves by the MicroTrac-Software. To do so it is necessary to establish a correlation between BioTrac and plate counts or another counting method. An already available calibration curve can be used under the same conditions after a check against the reference method has been made. What is the indirect method? 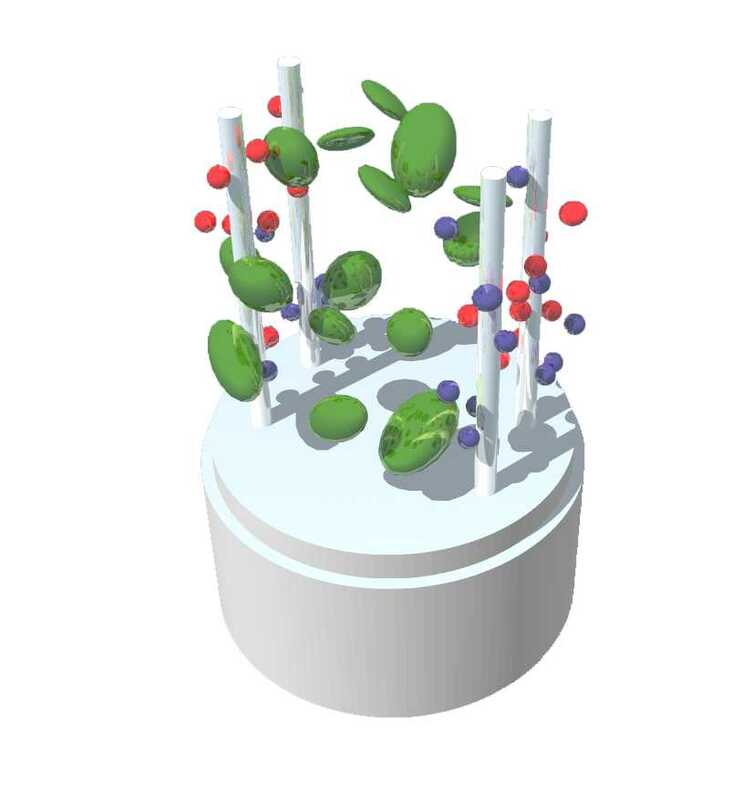 Besides the direct measurement of impedance in the nutrient broth, the detection of carbon dioxide (CO2) produced via the microbial metabolism provides an additional option of recording the activity levels of microorganisms. In this process the impedance change is not detected directly in the nutrient, rather it is the change in impedance of a potassium hydroxide solution caused by the uptake of the CO2 formed that is detected. The indirect impedance measurement represents a rapid and very simple process with pronounced higher sensitivity for the detection of CO2 production. For the detection of yeasts and moulds in particular, whose changes occasionally are hardly registered in the direct method, the indirect method is far superior. Do all microorganisms form CO2? All aerobic proliferating micro-organisms produce CO2 as the terminal product of cell metabolism and are therefore suitable for detection with the indirect method. How much time can be saved using impedance technology compared to traditional plate count method? Depending on the microorganisms to be analysed the time saved due to use of the BioTrac varies from 12 hours for coliforms to several days for yeasts and moulds, clostridia and beer spoiling bacteria. Furthermore it is not necessary to make dilutions after sample homogenisation and to poor plates and count colonies. Please contact SY-LAB for further details. What kind of microorganisms can be detected and what is the detection limit? Many different kinds of bacteria - like TVC, Enterobacteriaceae, coliforms, Salmonella and Clostridia - and yeasts and moulds can be detected with the BioTrac. Basically there have to be living cells in the measuring cell to give an impedance signal. Therefore the detection limit for liquid samples is usually 1 / ml and for solid samples 10 / g. If a pre-enrichment is done the presence in 10 g or 25 g can be tested. In combination with membrane-filter technology e.g. 100 ml of water or lemonade can be analysed.